PARIS—While this match pits the No. 1 seed vs the No. 10 seed, it’s an exceedingly difficult one to call. Each point favoring one player can be countered with a point favoring the other. Their head-to-head history clearly favors Halep. She leads 5-2, and has won their last four meetings. Stephens’ only two wins came over the course of one month at the beginning of 2013 in Australia. On the other hand, Halep’s two most recent victories came last summer, when Stephens was in the process of coming back from surgery, and hadn’t yet found the form that would take her to the US Open title. That has certainly been true over her last three matches in Paris, all of them straight-set, no-sweat wins. Halep, by contrast, has a mixed record in finals. She has played a lot more of them—she’s 16-14 overall—but experience doesn’t seem to have helped lately. Over the last 12 months, she has lost finals in Paris, Cincinnati, Beijing, Melbourne and Rome; her one final-round win during that time came in a smaller tournament in Shenzhen. Getting tight at the finish line has become an unfortunate habit with Halep. Then there’s the dynamic of their matchup, which is a tricky one that could play out in a number of different ways. Both end up playing a lot of defense, but both have the tools to attack. The question for each of them on Saturday will be: Does it pay to take on the burden of being aggressive? Halep will likely be the one to pay that price; despite her modest size, she’s a creative player with a proactive mindset. Stephens, by contrast, has that famous “easy power” when she wants it, but what she mostly wants to do is react and counterpunch. The rallies could play out in a variety of ways, and may change from set to set, but I’m guessing they’ll come to down to whether Halep’s offense can break down Stephens’ defense. “I have to just play like I did yesterday,” Halep said, referring to her successfully aggressive performance against Garbiñe Muguruza in the semifinals. Sounds like a snap, right? 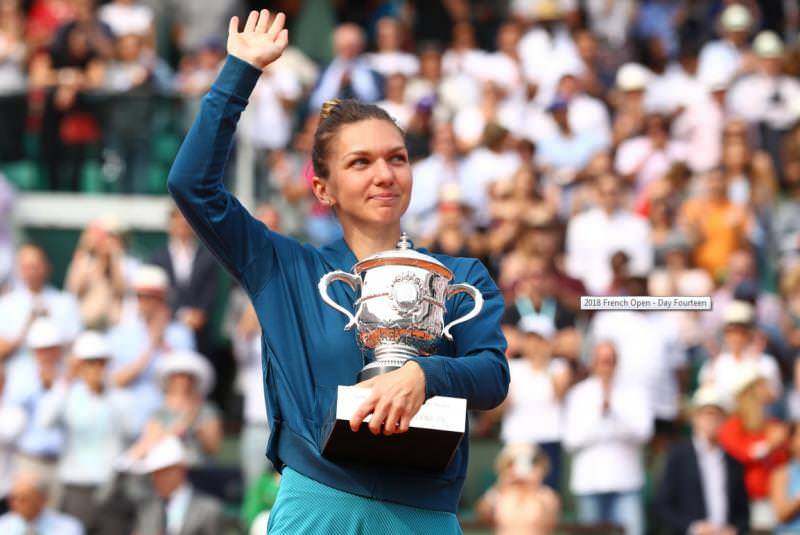 Pulling it off when the stakes are this big may come down to whether Halep, if she builds a lead, can hold her nerve and ignore her close losses in the French Open final last year, and the Australian Open final this year. Sloane might be the last player she wants to face in that situation. oh, boy! Another disappointment for Halep and me? Sloanie 6-3 1-0. Had they asked Simona at the start of the tournament which top 10 player she'd prefer playing in the finals, she would've said Sloanie without hesitation. Tailor made. The most annoying thin is knowing one Madd is somewhere full of glee, as opposed to his usual crap. This was kind of boring IMHO. But less boring than the Aussie Open snooze fest championship match.#ed_op#br#ed_cl##ed_op#br#ed_cl#In the first set, Halep couldn't find the court. She was looking for angles, trying to move Sloane around but she was missing. Sloane was just pushing her balls safely inside the court, not trying anything complicated. No big returns. No angles. No power shots. Just the safe tennis she likes to play. Sometimes one can be too safe; too lay back. Her serves were too slow for the occasion.#ed_op#br#ed_cl##ed_op#br#ed_cl#Then Halep stopped missing. And it was Sloane that was spraying. And it's not because Sloane was looking for angles or hitting big shots. She was doing the same thing she did in the first set. Safe balls in the middle of the court. No power. Nothing. This is what frustrates me about her game. Too safe. But that's how she wins her matches. It works for her.#ed_op#br#ed_cl##ed_op#br#ed_cl#Each player only hit 1 ace: 1 for Sloane in the first set, and 1 for Halep in the last game. #ed_op#br#ed_cl#Halep had 18 Winners for 26 UEs#ed_op#br#ed_cl#Sloane, 16 Winners for 39 UEs#ed_op#br#ed_cl##ed_op#br#ed_cl#Halep had no choice but to win today. She's already made it a habit of losing in slam finals and she had to break the curse. She was lucky she was playing Sloane who didn't force anything. Once Halep stopped missing, Sloane got frustrated because she was not getting a slew of free points. #ed_op#br#ed_cl##ed_op#br#ed_cl#Halep was still trying to move Sloane around and the balls were going in, unlike in the first set.#ed_op#br#ed_cl#No stinking winners; no aces; no return winners from either player. Not my type of tennis. #ed_op#br#ed_cl##ed_op#br#ed_cl#I loved Pliskova vs Serena, Barty vs Serena, Julia Goerges vs Serena.#ed_op#br#ed_cl##ed_op#br#ed_cl#For the Pliskova match: #ed_op#br#ed_cl#15 aces and many winners from Pliskova; 13 aces and service winners from Serena. Huge, powerful ground strokes .... punishing 2nd serves .. Loved it. #ed_op#br#ed_cl##ed_op#br#ed_cl#Serena hitting only 12 UE against Julia Goerges' 11 aces and powerful groundies. Yup, I love it when a player tries to impose her game... #ed_op#br#ed_cl##ed_op#br#ed_cl#Halep was lucky she didn't have to face Serena with the kind of game she played today. #ed_op#br#ed_cl#Congratulation for finally winning a slam. Now she can relax.#ed_op#br#ed_cl##ed_op#br#ed_cl#Hello Wimbledon. Last edited by Ace2Ace on Jun Sat 09, 2018 10:39 pm, edited 5 times in total. José Morgado#ed_op#br#ed_cl#&#8207;#ed_op#br#ed_cl#Verified account#ed_op#br#ed_cl# #ed_op#br#ed_cl#@#ed_op#b#ed_cl##ed_op#a href="http://www.tennisforum.com/member.php?u=15342" target="_blank"#ed_cl#jose#ed_op#/a#ed_cl##ed_op#/b#ed_cl##ed_op#br#ed_cl#morgado#ed_op#br#ed_cl# 2h2 hours ago#ed_op#br#ed_cl#More#ed_op#br#ed_cl#A fun stat: #ed_op#br#ed_cl##ed_op#br#ed_cl#Simona Halep is the first player to beat three Grand Slam champions in QFs (Kerber), SFs (Muguruza) and F (Stephens) to win a Women's Singles GS title since Justine Henin at the 2007 US Open (Serena, Venus, Kuznetsova). Last edited by Ace2Ace on Jun Sat 09, 2018 10:41 pm, edited 7 times in total.